Dr. Ravi Gandham completed B.V.Sc. & A.H. at College of Veterinary Science, Tirupati, Andhra Pradesh Agricultural University; M.Sc. 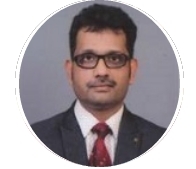 (Dairying) in Animal Genetics and Breeding from National Dairy Research Institute, Karnal; and PhD in Animal Genetics from Indian Veterinary Research Institute, Izatnagar, Bareilly. He underwent training at School of Informatics, Indiana University Purdue University Indianapolis, USA in the field of Computational Biology and Genomics. He joined NIAB on 24 May 2018. Dr. Gandham is experienced in the field of Animal Genomics and Computational Biology. He is a combination of being a computational and experimental biologist. He has handled several externally funded projects. He worked on host pathogen interaction to delineate molecular pathogenesis using high throughput genomics and proteomics approaches and assembled several genomes of pathogens. The results from the analysis of RNA-seq, miRNA-seq and proteomics data were validated through Real Time, Western Blot or Dual Luciferase assay. The signature molecules identified are now being studied through CRISPR/Cas9 knockout studies. His research interests at NIAB are host-pathogen interaction, Genomics and Functional studies.